Sure, you’ve heard of Dr. Jekyll. But what do you know about his daughter? But her hunt leads her to Hyde’s daughter, Diana, a feral child left to be raised by nuns. With the assistance of Sherlock Holmes and Dr. Watson, Mary continues her search for the elusive Hyde, and soon befriends more women, all of whom have been created through terrifying experimentation: Beatrice Rappaccini, Catherin Moreau and Justine Frankenstein. We’re excited to share an exclusive excerpt below, in which Mary meets Sherlock Holmes and Dr. Watson for the first time. The excerpt also features amusing interjections from Diana and Beatrice, who—along with the other main characters—chose to comment on the manuscript (much to the author’s chagrin). Mary followed Mrs. Hudson up a narrow flight of stairs to the second floor. At the top of the stairs, Mrs. Hudson knocked. “There’s a lady to see you, Mr. Holmes,” she called through the door. A shot rang out, and then another. Mary flinched, both times, but Mrs. Hudson seemed not to notice. “All right, let her in.” The voice implied that whoever she was, she would be an infernal nuisance. Mrs. Hudson paused for a moment, in case Mary might reveal what that problem was. An angry father? An absconding fiancé? But Mary said, “Thank you very much, Mrs. Hudson,” and walked into the flat. Yes, it was indeed a terrible mess. On the mantelpiece, above the fireplace, were skulls, repre¬senting what Mary recognized as different physiognomic types, in a row from highest to lowest. The last one in the row was obviously the skull of an ape, but in an effort to be humorous, perhaps, someone had put a top hat on it. By the window stood a camera, from which an opera cape was hanging, probably for whomever was going to wear the top hat. The long table in front of the window was covered with equipment of various sorts, just as her father’s laboratory table had been: she could see a smaller portable camera, a Bunsen burner and microscope, glass jars filled with what looked like human ears swimming in liquid. Casts of hand- and fingerprints. Boxes of dirt in a variety of colors, from light red to black. Along the wall across from the fireplace were bookshelves, overflowing with books. There were books stacked on the floor, the sofa, and one of the armchairs. On the other armchair was a violin. The man in the middle of the room was holding a pistol. He was tall, with a high forehead and the sort of nose they call aquiline. He looked, Mary thought, like an inquisitive eagle. His shirtsleeves were rolled up, and he was pointing the pistol at the wall. Diana: You’re not going to make him the hero, are you? Because that would be sickening. Beatrice: I think Mr. Holmes would make a very good hero. By the mantle, the wallpaper was pocked with bullet holes in a pattern: VR, VR, VR—Victoria Regina. For a moment, Mary wondered if she should have gone straight to Scotland Yard. The second occupant of the room rose from behind a stack of books on the sofa. “What are you thinking, Holmes? You’ll scare the girl.” He was shorter, stockier, with a mustache. Unlike his friend, he was properly dressed, in a jacket and tie. Mary put her umbrella in the stand, beside a pair of fencing foils. “Here, Miss Jekyll,” said Watson, moving the stack of books from the armchair nearest the door. She sat down, noting the cig¬arette burns on the arms, and put the portfolio on her lap. “My mother died recently,” said Mary. “I was not involved with the case directly, but you would have read about it in the newspapers. The murder was marked by its particularly vicious nature and the high position of the victim. Sir Danvers Carew was a member of Parliament, a personal friend of Gladstone, and a prominent supporter of Irish Home Rule. The facts, in brief, were as follows.” He swept aside a stack of books on the sofa, sat with his elbows on his knees, and tented his fingers together, then stared at the wall just over Mary’s head as though actually seeing the events he was describing. Mary looked down at her boots. Well, next time she would gather more distinctive mud for Mr. Holmes! Seriously, did they need to go into all the particulars of the Carew murder? She was starting to lose her patience. Yes, that was what Mary had remembered last night: a tall man in her father’s study, walking back and forth on legs like scissors, and old Poole telling her not to interrupt because her father was talking to an important gentleman, a detective. She had deduced that it must be the famous Mr. Holmes, whose cases were featured so often in The Strand. “And yet, I may know where to find Hyde,” said Mary. 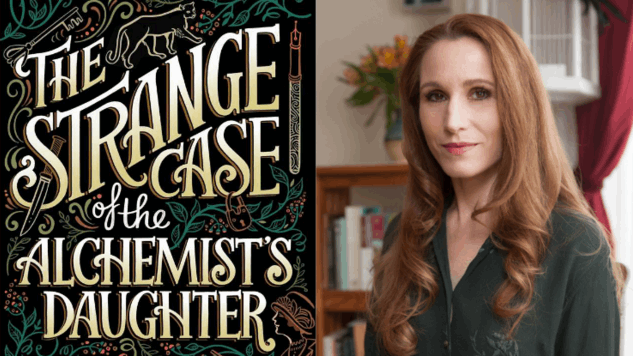 The Strange Case of the Alchemist’s Daughter is available now from Saga Press.